OC Transpo tweeted on Monday and Tuesday that they would be expecting several cancellations and delays due to winter weather conditions, but riders feel like they are left out in the cold as to why. Ottawa transit riders were perplexed this week as to why OC Transpo warned of cancellations and delays due to winter weather when much of the weekend's snow has been cleared. The transit agency tweeted about the expected delays on Monday and again on Tuesday. Several passengers were confused by this, since it had hardly snowed since the weekend. Pardon? The roads are fine. It’s cold, but the sun’s out. It has also been almost 48 hours since the snow stopped. Tough sell. I’m struggling to understand how there are frostbite advisories issued by Ottawa Public Health &amp; <a href="https://twitter.com/ottawacity?ref_src=twsrc%5Etfw">@ottawacity</a> yet <a href="https://twitter.com/OC_Transpo?ref_src=twsrc%5Etfw">@OC_Transpo</a> routes are over 45 minutes behind (or not showing up) leaving people (incl. children, elders, etc.) out in the cold for almost an hour in -30. 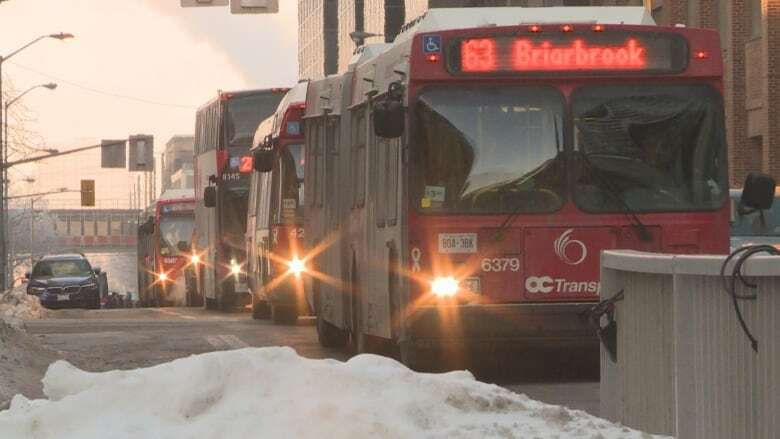 Though passengers feel like they are being left out in the cold, OC Transpo says delays and cancellations are due to more than just weather conditions. "Cancellations can occur for a myriad of reasons," customer services manager for OC Transpo David Pepper told CBC Radio's All In A Day. Road closures, detours, collisions, and lack of spare bus drivers are just some of the reasons cancellations and delays can occur, Pepper said. But winter weather conditions can compound these issues, he added. Hi Vanya, very sorry for this. The bus encountered delays on its previous route due to traffic and road conditions. "With colder weather we have more bus passengers, more customers, so that will make for longer boardings," which can cause delays, Pepper said. Other ways Pepper said winter weather can strain the system include mechanical issues, a bus taken being taken out of circulation to provide shelter — during a fire for example — and driver availability. Bus drivers could be late or sick in winter weather, Pepper said, and while they do have spare operators, sometimes the number of absences can exceed the number available. "Some days even the backup plans are not enough to deal with the incredible impact of — in this case … weather." In cold weather OC Transpo wants passengers to be aware that cancellations and delays can occur and be prepared and ready to adapt, Pepper said. "You have to understand that [transit] systems are all vulnerable to any number of things." But once the LRT system is in place, customers should expect fewer delays and cancellations, Pepper added.